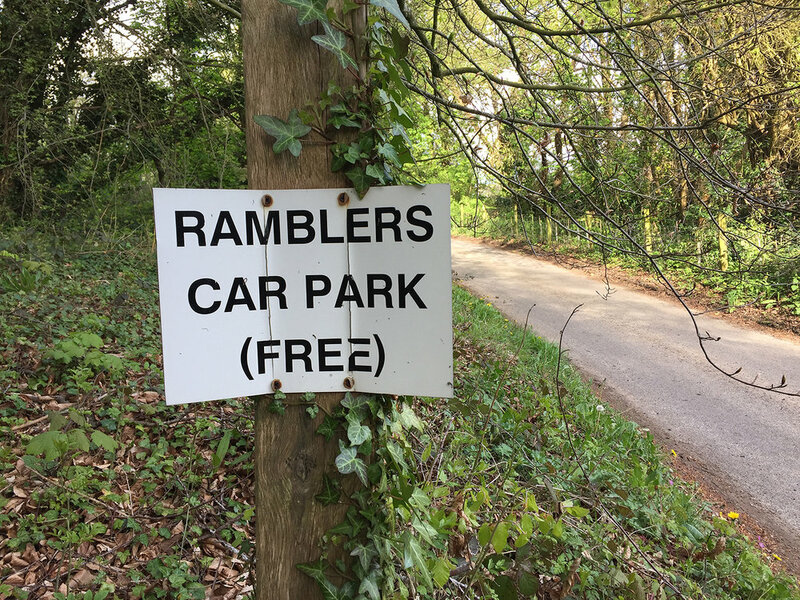 Ridgeway and Cotswolds walk., six days, April 2018. I moved to Wiltshire, England, when I was fourteen years old. Wilshire is an agricultural county known for ancient forts, old trade walkways and mysterious earth mounds. 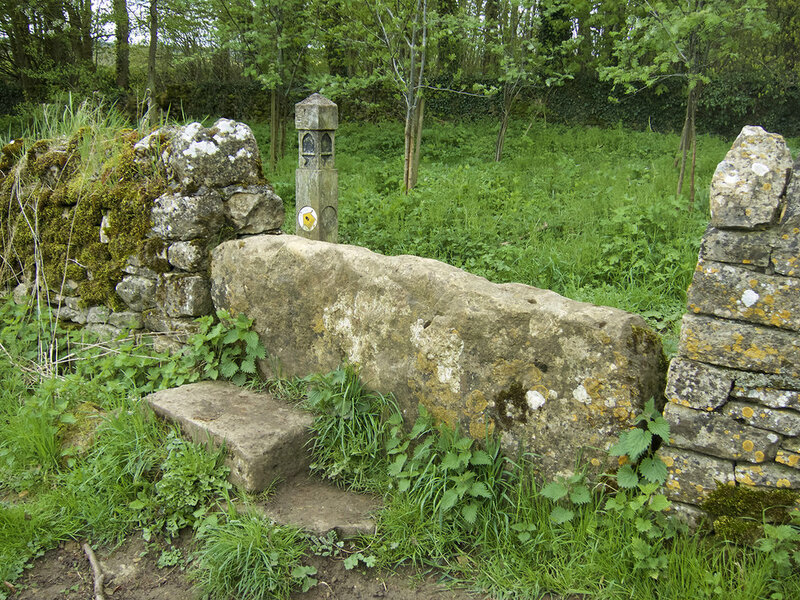 I contrive a return trip with Margi to spend three days walking on portions of the Ridgeway Trail, and another three walking in the better-known scenic Cotswolds area. 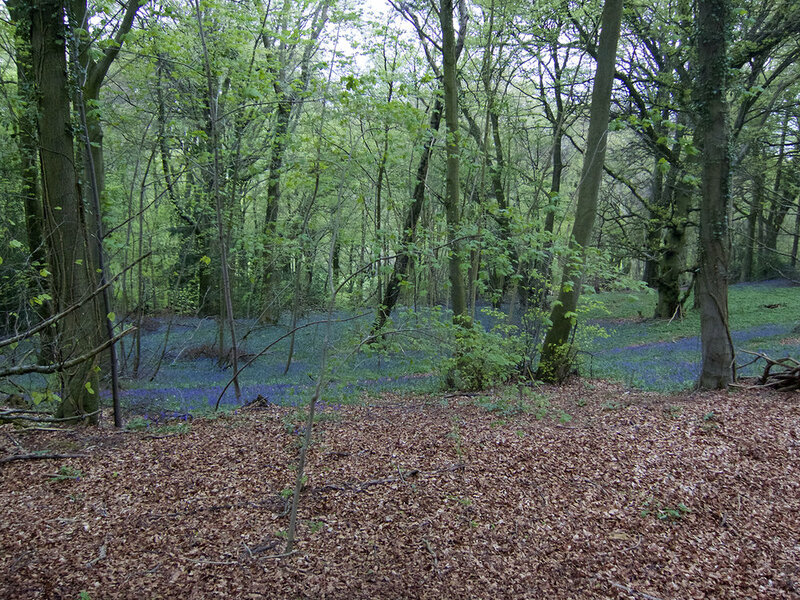 We take the train from London to Oxford, then a bus to our starting point in Watlington. As this trip is comprised of day walks and nights sleeping in various inns, we carry almost nothing. This trip will be quite different from my rugged Sierra backpacks, as there are amenities to be had all along the way. It also becomes apparent that Wiltshire has been gentrified since I lived there by a combination of tourists and wealthy Londoners who maintain multiple homes. Good wine and semi-fancy food is available the entire trip. The trails are actually a network of right-of-ways that have been carefully preserved for many years by walking associations, and they are well signed. They are usually just footpaths but also sometimes dirt roads with no cars. Most of the walkways run alongside or through different farms, offering nice views. I assume that the hacked-off nature of this hedge is to encourage a particular kind of growth. Or something. It rains intermittently, so wet slippery leaves and mud patches are part of the experience. We pass many old churches and graveyards. One gets the impression that there is not much historically accurate maintenance. We pass and even walk through the occasional golf course. They seem delightfully natural and casually placed. Ditches and large holes evidence some long-ago human activity. 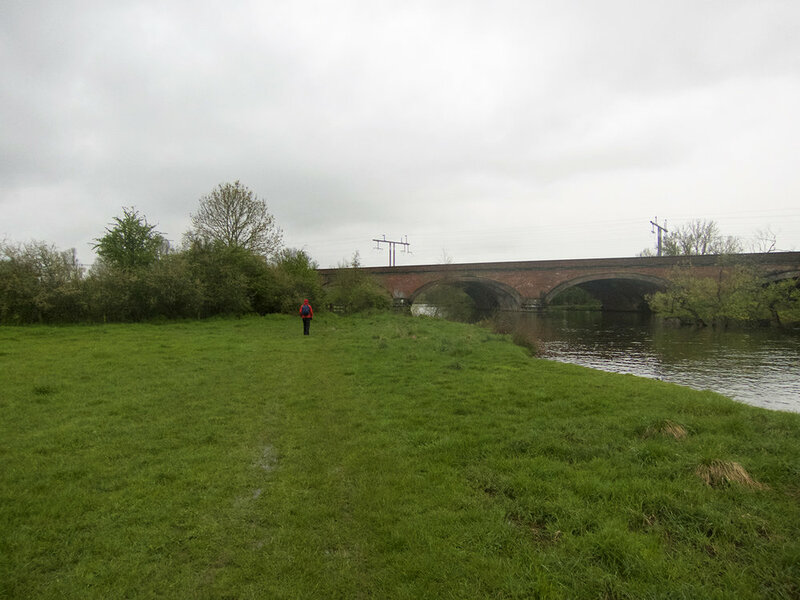 The trail weaves alongside the Thames for several miles. Rainpants and a rain cover on the backpack are necessary. We reach our first night destination in Goring. 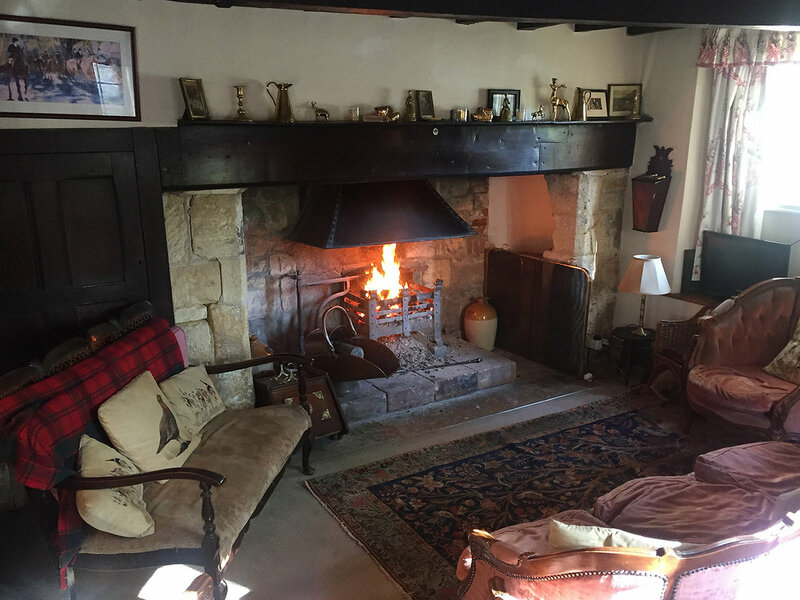 This house is a B&B with beautifully maintained grounds. We are joined in Goring by our friends Andy and Gill from London. The all-white carpet in the bedroom is concerning as our clothes are all muddy. DAY 2- Uffington Castle to Liddington, 13 miles. We take a cab to kick off the hike at Uffington Castle, an impressive title for some earth mounds. It becomes very foggy as we walk up the path. We slightly take note in the distance of what appears to be a man lying down for some mysterious reason. After about one minute, my view is sharp enough to notice that the man’s hand is in the air and not moving. I take off running and without words passed Andy follows where we find the man staring at the sky, not breathing, very warm. I start my version of CPR while Andy fumbles with his iphone to obtain GPS coordinates and to call the local authorities. Amazingly, the team shows up in about seven minutes and performs all sorts of advanced rescue procedures, but I am convinced the the man is indeed quite dead. He was in the act of hauling an electric-powered cart up the hill containing several gliders. Nice looking old bloke. We should all be so lucky to die so quickly and cleanly while doing something we love. We regroup and make it up the hill to the “castle”, which is not a lot more than some earthworks. There is also the famous chalk white horse earthwork nearby, but our party is a bit rattled by the last encounter and is eager to leave the general area and we never get to see that white horse. We reach the Neolithic long barrow called “Wayland’s Smithy”, dated as having been started in 3590 BC as a burial place. In my return to the Ridgeway I had hoped to learn something about the archeology of the area, but in fact almost nothing is really known about the ancient people of the area and the various landscape evidence. Apparently significant sums have been spent on excavations without revealing much at all. The beauty of the walkways continue to astound. We divert one mile off the trail for a pub lunch. One motivation for this trip is to visit my old house, which is actually a collection of three joined cottages dated 1614. 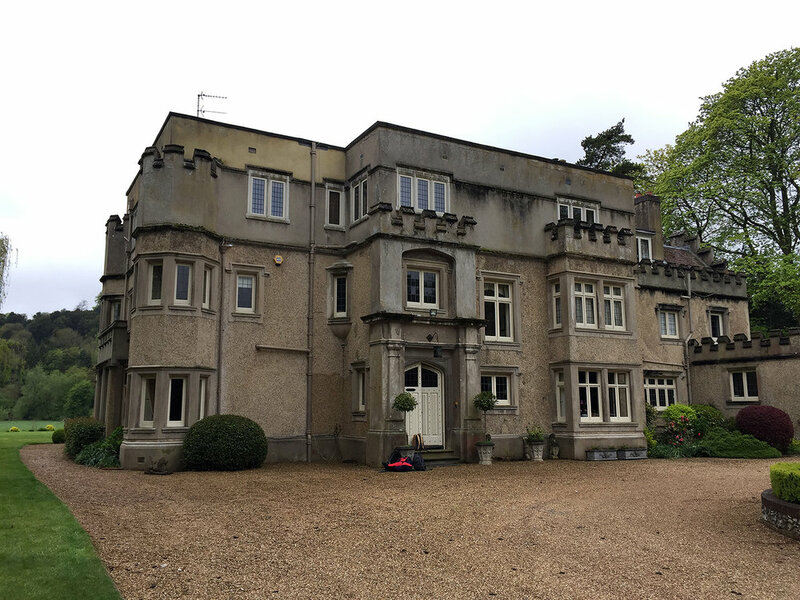 The new owners are not home but gave advance permission to tour the grounds. When I lived there I remember large fireplaces, massively thick walls, and having to duck under several doorways. I also remember that in my time the entire town of Chiseldon smelled of coal, but no longer. We visit some old family friends at a local farmhouse. Between farming and riding they are accustomed to constant mud. We have a very pleasant stay at the Meadowlark B&B in nearby Liddington. We rarely see other hikers but often see locals with their dogs. There were also few trail bikers. This view nicely encapsulates my memory of driving through the country in Wiltshire; wide open spaces, no industry, and clumps of trees I always assumed to be evidence of past human settlements. And a bit of water and mud. We reach the famous Avebury Stone Circle, which seems to be a series of concentric ditches with strange upright stones in the center circle. We all take a cab to Swindon and we say goodbye to Andy and Gill. Our train is cancelled, so we must take a train to Oxford and then an expensive one-hour cab ride to our lodging in Chipping Campden. DAY 4- Chipping Campden to Stanton, 11 miles. We awake in Chipping Campden and walk around town for an hour. This field is so studded with rocks it is hard to imagine how to grow anything here. There are a remarkable number of different types of passages over the walls. 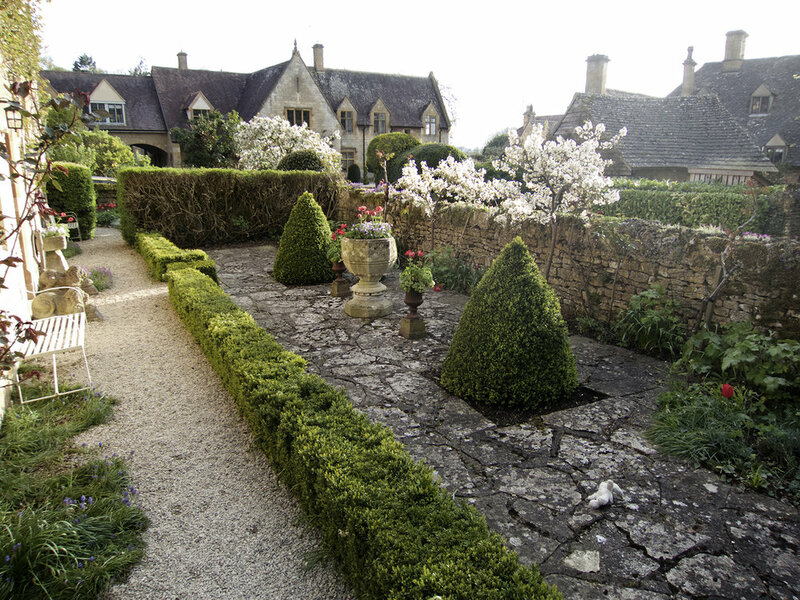 The Cotswolds are known for stonework and it varies in color, type and arrangement every few miles. Although much of the walk is defined by gates and hedges, some is not and it is liberating and fun to walk across open areas. We reach Broadway for a quick lunch. It is beautiful, but the Range Rover crowd vibe is intense. We arrive in Stanton, a very small village of impeccable buildings. DAY 5- Birdlip to Painswick, 5 miles. We start the day with the traditional English Breakfast, and then take a cab for a quick tour of Cheltenham. I am fond of Masonic lodges and their oftentimes mysteriously mute presentation. The pump house is impressive to view from the outside but needs interior restoration. It looks substantial but is mostly stucco construction. Parts of the forest are impressive, but the trail is embedded in much more developed country and the noise from the nearby roadway degrades the experience. It rained the night before and without hiking poles the slippery path becomes tiresome. We enter another wide-open golf course. We pass through a still operational stone quarry. Painswick is another stone town but with another completely different color and texture from what have seen previously. 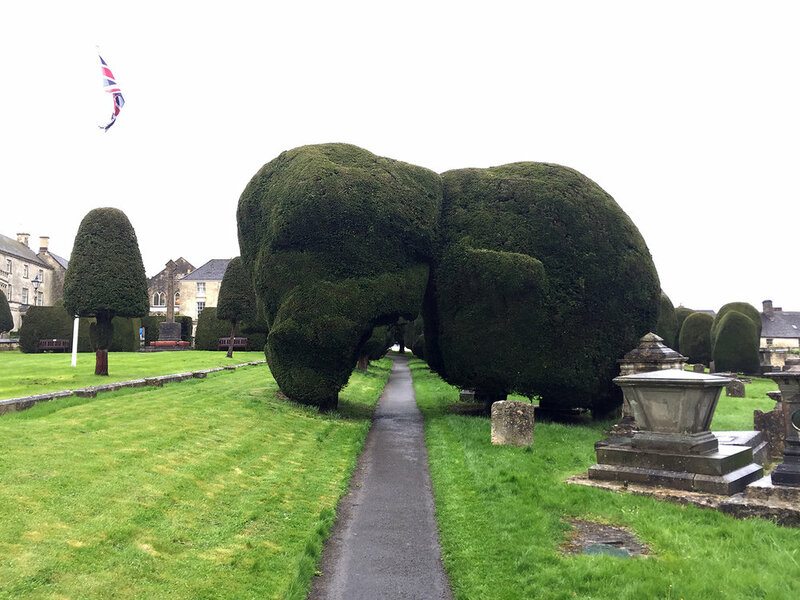 Painswick also features a graveyard full of very strange sculpted trees. 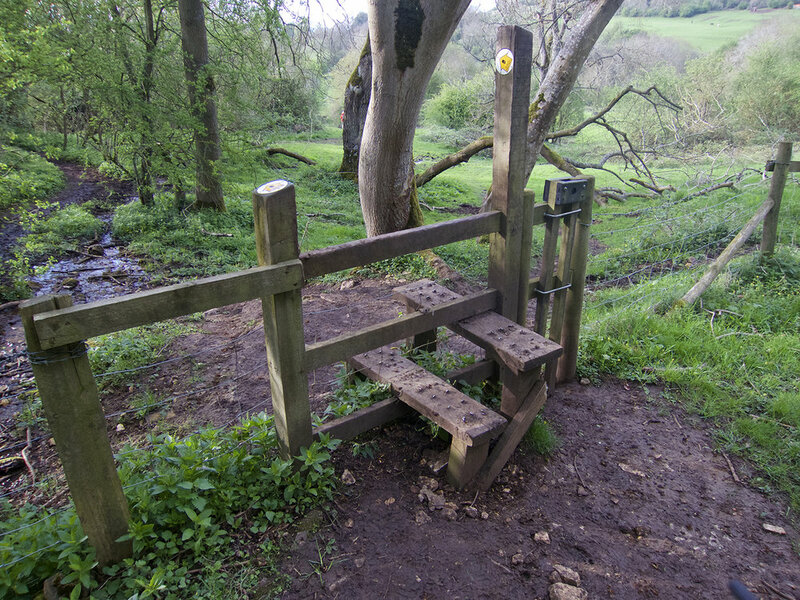 It rains very hard that night in Painswick and we know that the final day of our planned hike will be too muddy and slippery to be enjoyable, so we take a bus from Painswick to Bristol to have a look around. This is a view of the Clifton suspension bridge by Brunel and completed in 1864, taken from inside the nearby camera obscura at the Clifton Observatory. 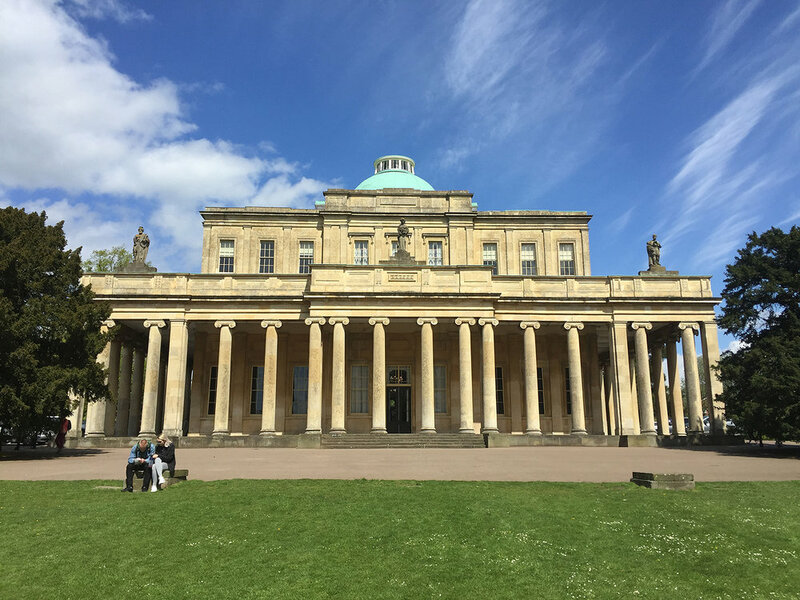 We arrive in our final destination of Bath with its magnificent 18th century Georgian architecture. I was impressed by the paintings at the Holburne Museum. In particular there is a series of “theatrical” paintings that defy the usual boring British stereotypical painting style. In conclusion, I believe that our strategy of jumping around to the best parts of the two trails is a good one. Wiltshire is more remote and wide-open country, while the Cotswolds are tighter, more highly developed, cuter, and offer more towns and architecture. I advise taking hiking poles and waterproof boots, and be ready to bail on the really wet days.